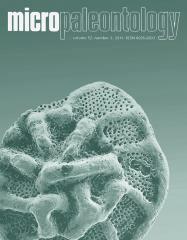 ABSTRACT: The taxonomic reevaluation of the Turonian–Coniacian planktic foraminifer Huberella Georgescu 2007 shows that it consists of three species: H. praehuberi Georgescu 2007, H. huberi Georgescu 2007 and H. yucatanensis – new species. Huberella accommodates a branched lineage, which evolved from the biserial species Planoheterohelix postmoremani Georgescu and Huber 2009. This lineage led to the first development of the backward chamber extensions in the Cretaceous heterohelicids. Huberella huberi is a latest Turonian species which became extinct at the Turonian/Coniacian boundary and can be used in refining the Cretaceous planktic foraminiferal biostratigraphical framework.